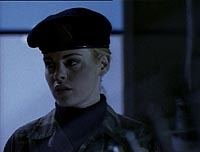 Universal Soldier 2: Brothers in Arms (1998) - Sci-fi-central.com.  Canada  1998  92m   Directed by: Jeff Woolnough.  Starring: Matt Battaglia, Andrew Jackson, Eric Bryson, Kevin Rushton, Desmond Campbell, Michael Copeman, Gary Busey, Burt Reynolds, Richard McMillan, Chandra West, Aron Tager, Barbara Gordon, Carla Collins.  Music by: Ivan Doroschuk, John Kastner, Steve Pecile. 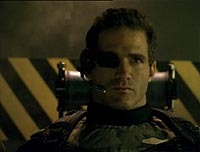 After the terrible events of the original Universal Soldier testings, the budget has been slashed by the government. 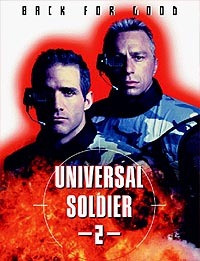 Under the orders of a CIA director, a gang of mercenaries take control of the new line of Universal Soldiers and try to use them into helping to smuggle diamonds to the highest foreign buyer. When Luc Deveroux, survivor from the first incident, continues to cause problems, his newly found younger brother is taken prisoner along with his news reporter friend Veronica Reynolds. Matt Battaglia picks up the character of Luc Devereaux where JC Van Damme left off. This again sees him going AWOL but brings in other characters (including his reanimated brother Eric) and has yet more secret Government conspiracy in the shape of Gary Busey and Burt Reynolds. 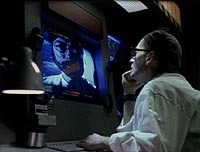 This "made-for-TV" film is a poor distant relative of the first Universal Soldier. I'm not saying the first one is a great film (it's an OK action movie) but if the first one was the President of the USA then this film would be the equivalent of his white trash, wife-beating drunken brother living in a trailer in Louisiana - it's that embarrassing to compare them. This fails in every aspect of what should be good in a film. The plot is lazy and relies on coincidence or unlikely events to move it on. A lot of things are either unbelievable or glossed over without explanation. However this is an action movie - so if the action is good then it matters less yeah? Unfortunately the action is poor, there's one explosion and all the fight scenes make WWF look fast and exciting, none of these guys have any moves or speed. 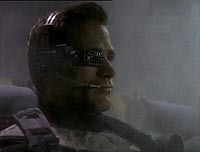 The action only has one good touch - where an explosion is set to classical music - however even this is a rip off of John Woo (remember "over the rainbow" in FaceOff?). The acting is lamentable. Battaglia's wooden performance will make even the hardest critic think that maybe Van Damme isn't that bad an actor after all. Jeff Wincott as brother Eric is not as wooden but still acts like he's being forced to do something he's not comfortable with. Chandra West as reporter Veronica should provide the human element to proceedings but all she is left with is rubbish one-liners and an unrealistic sense of calm. As for Burt Reynolds and Gary Busey.....I could fill a page with my comments on them. Reynolds spends most of the film in the shadows (I understand why) and delivers a rubbish accent throughout - why does someone who just got a career boost with Boogie Nights (and to a lesser extent Bean) commit to appear in this type of rubbish. Not even once but again in Universal Soldier 3!! It also is sad to see Gary Busey do another low-rent villain in a rubbish film - it's hard to believe that he is very well known and once did some high-profile films. This is yet another flush on the toilet that is his recent career. The direction is so-so, relying on editing that Homicide: Life on the Street did years ago. Slow-motion, "jumping" edits etc all make the film a little more interesting but really they're stolen from better directors and cannot achieve the impossible feat of saving this. This is a boring, poorly acted, poorly plotted "action" movie. Please avoid this vacuous piece of twaddle. Oh and if you enjoy this or think that it's good then you deserve a slap.